Pond fish such as the beloved koi fish play an important role in the nitrogen cycle of an ecosystem pond. Not only do koi dine on algae, but they provide a beautiful flash of color as they glide in and out of waterlilies. Koi and other pond fish make great outdoor pets … even learning to eat right out of your hand, if you’re patient! When you have a water garden of your very own, you’ll grow to love your fish as much as you love your cat or dog! An Eskimo Kiss is shared over a trickle of koi food pellets. Fido might look like he’s snarling, but he actually adores the koi fish and watches over them every chance he gets. 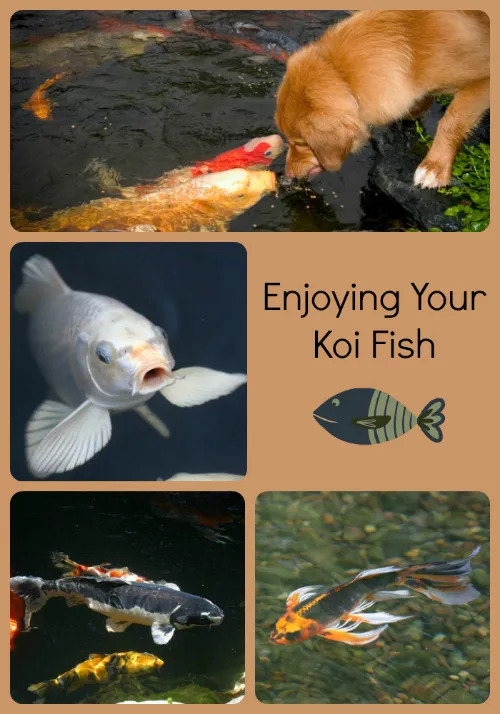 Learn more about feeding koi. This beautiful butterfly koi is a prized possession named Marathon. Special thanks to its owner for the photo! This ethereal, white koi fish is truly stunning against the cool, dark, watery backdrop. This festive koi shows off his feathery fins, dancing about in the cool waters, swishing his tail first one way, and then the other. And this golden koi fish gal proudly flaunts the latest shade of lipstick. Sometimes hard to spot in the water, Mr. Dark and Mysterious koi reveals intricate designs in his shimmering scales. A window frames the perfect view of our finned koi friends. This is a perfect indoor spot for a morning cup of coffee, delighting in the views of the backyard oasis. You simply can’t ignore this koi fish face! He may look like a Grumpus-Ala-Bumpus, but this Japanese koi is actually quite pleased with his pond. Another koi fish beauty skims the surface of the pond. They say not to name your fish, fearing you’ll become too attached. But when you see their personality reflected in the water garden, how could you resist naming your finned friends? How many koi fish do you have in your water garden, and have you named them?